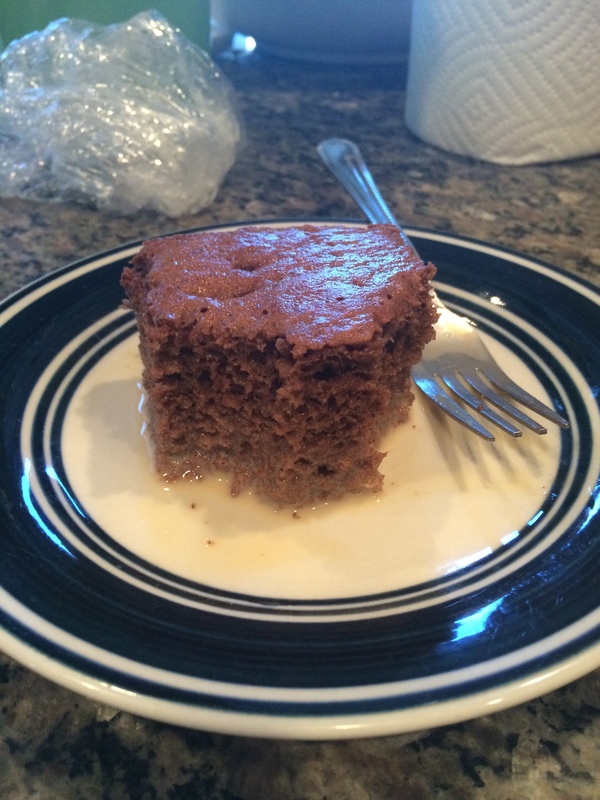 HomeHow NOT to make a tres leches cake…. 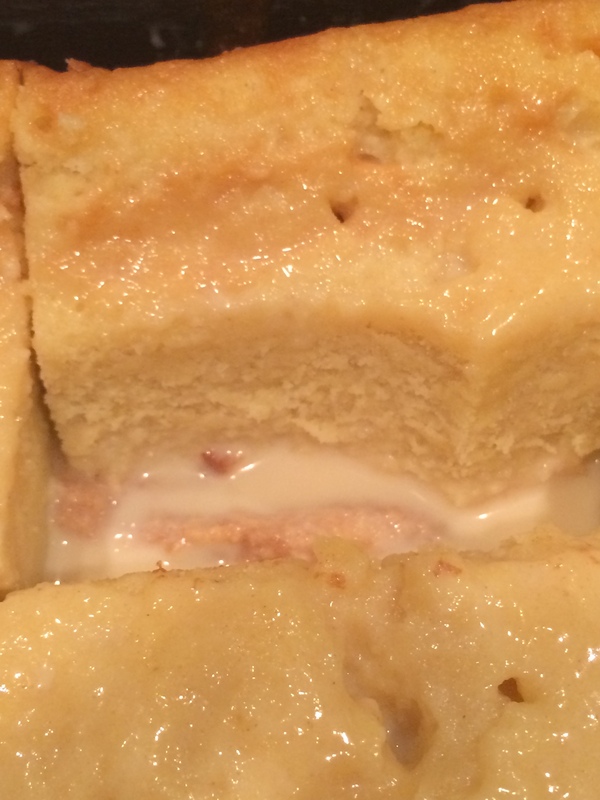 How NOT to make a tres leches cake…. For those of you who do not know me, I am a superb baker and cook. This week, I decided to try and make one of my fiance and my favorite desserts when we go out to eat. Tres leches cake. Sounds easy, simple cake with a milk mixture poured over top right? uhhhh, yeahhhh not so much apparently. Here I was, separating 7 eggs, creaming together sugar, butter and egg yolks, my fiance was furiously whipping the egg whites into stiff peaks and then I was combining dry and wet ingredients into a bowl. Fold in some egg whites straight into the pan and then bake for 25 minutes. I thought it had gone well until 25 minutes came and went and the center of my cake was still RAW. I mean serious, still pure batter raw. It took probably another 20 minutes to get the center of the cake cooked, and by then the edges of the cake were much more browned than I like. I figured, this is not so bad, the edges were slightly harder, but the middle was soft and seemed very moist. I went to pour the milk over the center of the cake collapsed. Completely sank in below the edges. Never in my life have I ever had a cake do this to me. I cooled the cake as the recipe called for and when I cut into it, it was the most dense cake I had ever seen in my life. It was about the texture of cookie dough. Yeah, It looks bad, but honestly still tasted very good, could have used a touch more vanilla, but otherwise tasted delicious. What went wrong though? I made sure my eggs were perfectly separated, I creamed my butter, sugar and egg yolks to exact specifications. Upon doing some research, it seems that it could have been a huge number of things, but the main culprits seems to the be that I put too much batter in my pan, I had too much fat in the cake and my egg whites deflated when I folded them into the batter. Not one to be very discouraged, I set out to revamp this recipe and make an even better cake (Plus, I added chocolate, which makes everything better). I cut the butter out of the recipe altogether. That was the only fat beyond the egg yolks and I decided that there was more than enough eggs to make up for the butter to be gone. I cut down on the number of eggs, cut down on the amount of flour and added powdered baking cocoa. I again creamed the egg yolks and part of the sugar together then adding some whole milk and vanilla, sifted together the dry ingredients and my fiance and I worked to whip the egg whites into stiff peaks (we really should buy a mixer with how often I bake) streamed in some sugar to help stiffen up the peaks and then had to fold the egg whites and dry ingredients into the egg yolk and sugar mixture alternating 1/3 at a time. This time, I separated the batter into 2 smaller pans, but a 9×13 would have worked for the amount of batter. Without fail, it took 25 minutes to bake, I cooked the milk mixture this time also so that it was hot and would absorb into the cake easier. If you have never worked with condensed milk, it is very thick, but if you mix it with other milks and heat it up, it thins out and will absorb much better! I cooled the cakes and then poured the milk over the top, the result? A fluffy and light tres leches cake that was perfectly moist! Easy and relatively quick to make, this one is definitely going to be a favorite for years and years in my house! Preheat oven to 350 degrees. You will want the rack in the middle of the oven as well. Figure out what pan you are using. This recipe will work for a 9×13 or you can use a round pans or smaller square pans, just make sure you do not use too much batter in any one pan. Using either softened butter or veggie oil VERY lightly grease the sides and bottom of the pan, then use parchment paper to line the pan, using the oil or butter to keep the paper in place. Start by separating your eggs, making sure that you do not get any egg yolk in the egg white bowl, if you do the whites will not stiffen up how you need them too. Set your egg whites aside as you will beat them right before you fold them into the batter. Add the 3/4cup of sugar into your egg yolks and whisk this together until it is a pale yellow color and is creamy, add your milk in and carefully whisk them together. Add vanilla next and combine. Set this bowl aside for now. In another bowl, sift together the flour, baking cocoa, baking powder and salt. Set this aside. Now starts the fun, if you have a mixer you will beat the egg whites on high until they are in stiff peaks, once in stiff peaks stream in the remaining 1/4 cup of sugar until peaks are very stiff, but have not dried. Should only take approx. 3-4 minutes for this whole process using a mixer. If you don’t have a mixer, using a wire whisk quickly whisk the egg whites until they are stiff, this will take much longer than with a mixer. Once stiff, stream in sugar and beat until sugar is combined and egg whites are stiff. To combine everything, start by adding 1/3 of flour mixture into the egg yolk and milk mixture, whisk this in until combined. Next, gently (and I mean GENTLY) fold in 1/3 of your egg whites. Once incorporated, add the next 1/3 of the flour mixture and fold this is. DO NOT whisk anymore, you will deflate the egg whites and your cake will not be fluffy and light. After that add the next 1/3 of your egg whites, and continue this until everything is folded in together. Pour your batter into the pan or pans and put on the middle rack of oven. Bake for 25 minutes and then remove from oven and let cool for 10 minutes. After cake has cooled for 10 minutes flip cake out of pan onto a cooling rack and allow to cool to room temperature. After cake is cool, put back into the pan you baked it in MINUS the parchment paper. Using a toothpick, poke holes approx. 1/2inch apart over the surface of the cake. Combine the milks into a sauce pan and cook over a medium-low heat stirring constantly (to prevent the milk from scalding) until the edges start to bubble (do NOT let it boil). Once the milk has reached this point, remove from heat and begin to pour over the cake(s). Pause now and then to allow the mixture to absorb into the cake. It should absorb VERY quickly though. After you have poured all the milk over the cake, wrap in plastic wrap (or use a lid if your pan has one) and place in fridge to cool. Let cool for a minimum of 2 hours, but overnight is even better. I do not typically use frosting on tres leches cakes. I prefer just some fresh cut berries to add a bit of tartness to the sweetness and richness of the cake, but you can always add an easy whipped topping or buttercream if that is your preference. My next baking adventure is going to be red velvet brownies! Can’t wait to tell you all about that! Can we add coffee instead of cocoa?? Putting coffee would create a very odd texture in the cake as it is typically not as finely ground as flour or cocoa powder. What you could do though, is add 1/2 cup of coffee to the milk mixture you pour over the top. If you are not a chocolate fan and want a vanilla cake instead, just do a full cup of flour instead of the 2/3 flour and 1/3 cocoa powder.